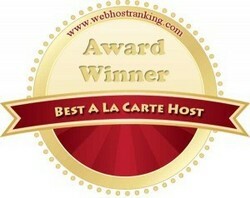 Web Host Ranking, (http://www.webhostranking.com) a major web host ranking site, awarded US Website Design and Hosting with its very first "Best A La Carte Award". This award was created especially in honor of the unique hosting package offered by USWDH, which they call the “Build Your Own Plan”. Web Host Ranking has recently discovered US Website Design and Hosting and thinks they offer some of the best web hosting features. In fact, Web Host Ranking has given them our Best A La Carte Host award because of their build your own package. The top-ranked Best Hosting 101, a website that is a source of information on web site hosting, with reviews and ratings, and listings of cheap web hosting companies has also featured US Website Design and Hosting in an article. To see the review at Best Hosting 101. In honor of this award, US Website Design and Hosting would like to offer all readers of Web Host Ranking, Best Hosting 101 and this release a Special Offer on our cheap web hosting. Just follow the link below and use this promotion code halfoffnewbiz, and you will receive 50% off on all new hosting packages purchased! Special Order Link Don't forget to use this code when asked for promotion code halfoffnewbiz to save 50% off your Hosting plan. Again we want to Thank http://www.webhostranking.com and http://www.besthosting101.com for the wonderful award and reviews.